India's Mid-Day Meal programme is the world's most ambitious free school feeding programme, providing cooked meals to more than 120 million children in over a million schools across the country. In a country where nearly half of the children are undernourished and struggle to go to school, the programme is a weapon to tackle hunger and illiteracy. Economists believe the programme bolsters primary school enrolment and attendance, eliminates hunger, enables children from diverse class and caste backgrounds to share a meal together and bury social prejudices, and provides children with hygiene and nutritional education. There is enough evidence to prove that the programme has, by and large, been a success, they say. As with most of India's large state-run social schemes, the performance of the free meals programme varies from state to state. States like Tamil Nadu - where the mid-day meal began in the city of Chennai (Madras) as early as 1925 - and Kerala and Orissa have reported good results. Results in laggard states like Bihar, Jharkhand and West Bengal have been less than impressive. The source of the food contamination in the Bihar school is not entirely clear yet - doctors say that they have found evidence of insecticide in the food; other reports talk about contaminated vegetable oil used in cooking. Tainted food supplies or awful kitchen hygiene could have led to the tragedy. Whatever the reason, Bihar, one of India's poorest states with a shoddy record in social welfare, has a long way to go in delivering an efficient mid-day meal programme for its more than 70,000 schools. Most of the beneficiaries come from poor families with an average annual income of $396 (£262) and where a third of the parents are illiterate, according to government estimates. A 2010 study by India's Planning Commission found that more than 70% of children in the sampled schools in Bihar were unhappy with the quality of the food served. A fifth of them said they did not get adequate meals. 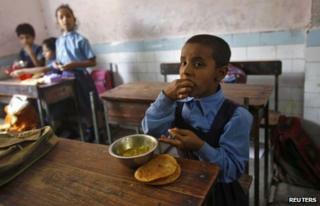 Three-quarters of the schools reported they did not have adequate utensils for cooking. The study also found that many schools in the state also did not receive their food stock "in a planned manner on a monthly basis, as a result of which a few schools were overstocked, resulting in breeding of insects [in the food]". Despite all this, more children have enrolled in schools across the state since the programme was introduced eight years ago. Economist Reetika Khera, who has extensively researched the programme, says the Bihar deaths are a "terrible tragedy". But, she says, they also come at a time when the programme is steaming ahead, and "showing huge improvements" mostly in northern India, where it was kick-started following a November 2001 directive from the Supreme Court to provide "cooked meals to all primary school children". "When the scheme began in northern Indian I remember many schools had no place to cook, no water. Teachers would double up as cooks, and children would collect firewood. Now schools have cooks and helpers, utensils and proper kitchen sheds for the cooking," says Dr Khera. Even the quality of meals has improved, say economists. In Rajasthan, remembers Dr Khera, children would be served unappetising meals of boiled wheat spiked with sugar and salt in the early days of the programme. Now the meals have become nutritious with a wide ranging and appetising mix. The state of Tamil Nadu provides a boiled egg to every child every day of the week. Rajasthan gives fruit to every child twice a week. The Bihar tragedy, say economists like Dr Khera, is not an indictment of the programme. But it proves India needs to tighten up its hygiene (children have fallen ill in Bihar and Goa and Delhi in the recent past after school meals) and improve safety at school kitchens (more than 80 children were killed in a kschool fire in Tamil Nadu in 2004) to make the Mid-Day Meal a programme it can be truly proud of.